With warmer weather coming our way, spring and summer foods cravings are now coming out of hibernation. 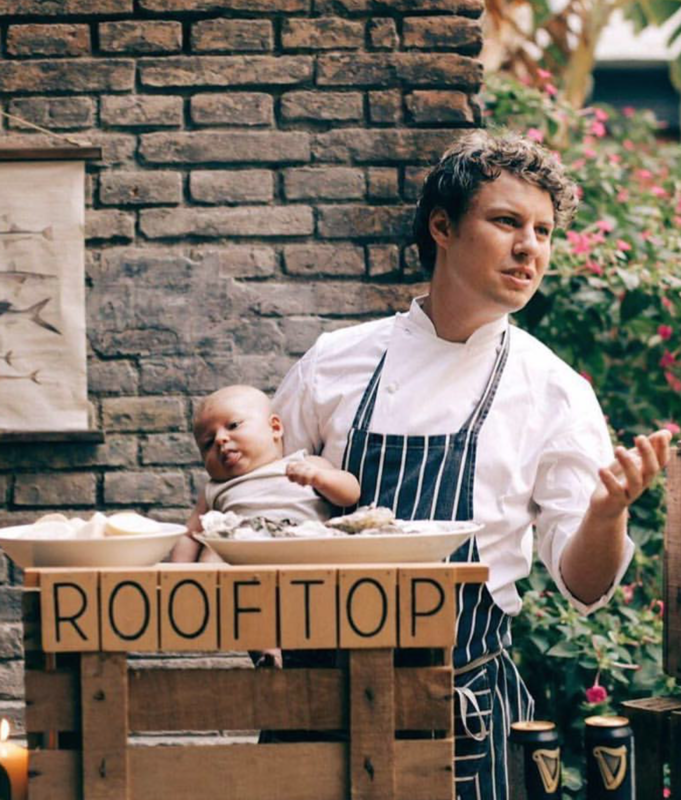 Meet the face behind Rooftop Smokehouse, Buster. This guy knows his way around a smoker. Buster Turner is the founder of and Chef at Rooftop Smokehouse – Smoked Artisan Goods. He started his smoked meat business on a neighborhood “rooftop” in Sant Antoni, Barcelona with his classmate from Hoffman Culinary school and friend Jakob Zeller a few years ago. In 2014 he opened a new central kitchen in the Fabrica Lehmann with his wife Carla; and in 2016 he collaborated with several high-end, high-quality cocktail makers to open a new location in the Borne, called the Pastrimi Bar at Bar Paradiso, where he sell his famous Pastrimi sandwich. Buster started off with an empty wine barrel on his neighborhood rooftop, from there the small snowball turned into an avalanche. Soon. Buster outgrew the rooftop, which led to the move in 2014. At Fabrica Lehmann, they found an old red brick smoke stack from around the 1850’s and incorporated it into the new location. Rooftop does more than just smoke meats, they also ferment, pickle, cure, and experiment. They are also ethically conscious, something very important to the company. They visit their suppliers personally and work closely with them with the changing seasons. This also helps Buster ensure that the meats, fish, vegetables, breads and other products are coming directly from local farmers or ecological friendly incentives. They offer a selection of locally sourced products like pastrami, bacon, duck, mackerel are among a few. Note that everything is homemade. With the menu changing every season, there is always new and interesting creations to try. Interested in Rooftop Smokehouse? Every month they host informal lunches and dinners, presenting you with opportunities to taste test and experiment with their food. They also host workshops and classes so that you can make your own food too. Or contact them to arrange an event of any kind. Check out a video we did with Barcelona BBQ last year!